I occasionally like to try new things. It really depends on my mood. Some days, I’m a bit more adventurous. Other days, I go with the same old, same old. I’m also incredibly lazy (or as I like to call it, I’m efficiently lazy. 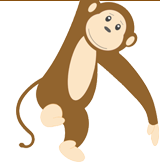 Translation: I move lightning fast to get tasks done so I have more time to do nothing). Being incredibly lazy means I’m not always up for the effort of trying something new. Well, today, I decided to try something new: Laughing Cow Party Cubes. I was at my local grocery store and decided to browse the umpteen aisles. I came across this pack of Laughing Cow Party Cubes intrigued by the variety of flavours with a choice of olives, onion, or goat’s cheese. They came in these cute little cubes that seemed to work really well for a mid afternoon snack at work. I like the original plain Laughing Cow cheese spread and decided to give them a taste test. My thoughts? Meh, I’m on the fence with this one. Laughing Cow Party Cubes are a processed cheese product so you know it’ll have a certain texture, right? I knew that and was prepared for the cream cheese texture. They’re savory and would pair well with crackers, bread sticks, or some other crunchy snack (rice crackers, perhaps?). For the most part, these Laughing Cow Party Cubes were pretty tasty. I preferred the one with olives and the one with onion. Both had the signature taste you’d expect but I wasn’t a big fan of the one with goat’s cheese. For me, it was a little too pungent and lacked ‘something’. 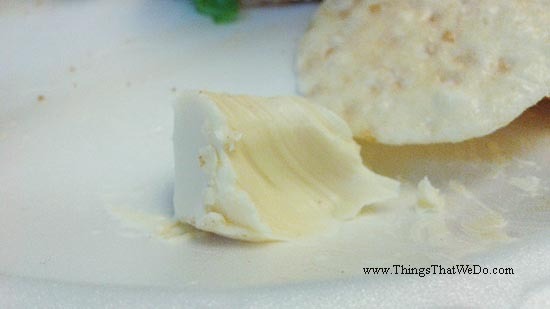 Thankfully, a pal at work likes goat cheese and happily munched them down for me. I’m just not doing back flips. What would make me like the Laughing Cow Party Cubes more? Hm…maybe if they had a bit of tang to them, some lemon perhaps or some dill? Right now, they’re just a little flat. They’re salty and they may taste like onions or olives or goat’s cheese, but that’s about it. Do the Laughing Cow Party Cubes taste good? What ingredients went into making these Laughing Cow Party Cubes? 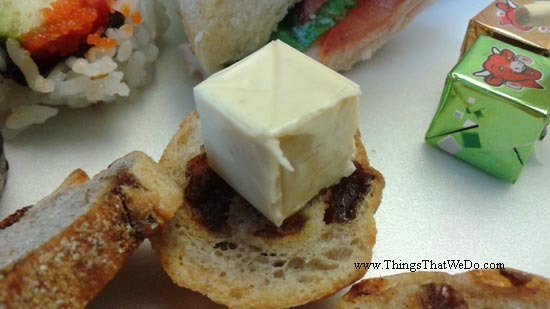 Here’s a list of the ingredients that went into the Laughing Cow Party Cubes: modified milk ingredients, cheeses (goat cheese in variety with goat cheese)(pasteurized milk, modified milk ingredients, bacterial cultures, salt, calcium chloride, microbial enzymes); in variety with olives: olives and salt; sodium phosphates, sodium citrate, in variety with onion: onion; in variety with goat cheese: goat cheese, flavour, salt, citric acid. Thoughts? Given that it is a processed cheese product, I’m not surprised by the list of ingredients. You can also see the nutrition facts label. Again, not surprised. Truth be told, I only had about 2 cubes with a few crackers so it’s not like I’d ever finish the entire box in one sitting by myself. Given their cute little cube portions, they’d probably be a neat addition to a party appetizer tray with some fancy crackers. Well, I did try something new and for that, thumbs up! 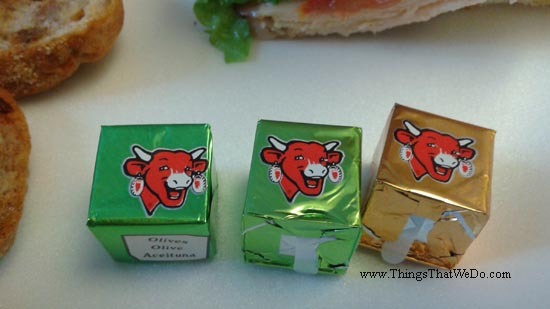 Overall, the Laughing Cow Party Cubes are okay and they certainly helped when I was hungry and needed a snack at work. Visit their website and you’ll see there are a variety of different flavours so it might be worth your while to pick something that might appeal to your palate. For now, I think I’ll stick with the original.